The government, after studying the waste management systems of all states, zeroed in on Punjab's low-cost and locale-specific sewage system to manage liquid waste and Tamil Nadu's integrated solid waste management. The plan is to replicate these models across the country, said government officials in the know. A team led by Rural Development Secretary JK Mahapatra, after studying the multi-pond system of treating waste water in the Seechewal village of Punjab's Jalandhar, last month asked the Ministry of Drinking Water and Sanitation to send experts there to see how the model can be standardised across the country. Largely conceived by environmentalist Baba Balbir Singh Seechewal, the model looks at diverting open drains, practice of segregation of solid and liquid waste, treatment of waste water through oxidation ponds, use of treated water for irrigation, and composting of solid waste. The government has sought inputs from officials in more than 150 village panchayats on the working of the model to be used for Swachh Bharat. The model has been adopted by the Centre for its Namami Ganga programme in Punjab. 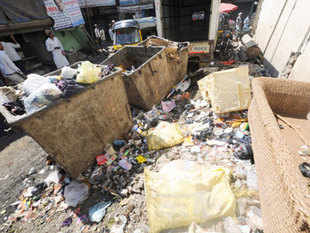 The government, said officials, is clearly impressed with the Tamil Nadu model of having integrated solid waste management - sweeping; door-to-door collection as well as transport, processing and disposal of solid waste; provision of public and community toilets; and construction of household individual toilets. "A city like Trichy has done well with respect to collection of waste from every household. MNREGA (rural employment scheme) workers can be made to collect and transport waste to plants. This will also make the transfer of fund to Swachh Bharat from MNREGA easier. Tamil Nadu is a state where MNREGA has been effectively used for Swachh Bharat work," an official said. This is also being done for effective integration of Swachh Bharat with MNREGA, the government's largest employment generation scheme. This is being tried out on a pilot mode in 500 villages where the Sansad Gram Yojana is being implemented, the official added.